Trust me on this one….this recipe will turn your head and heart around 180 degrees . You will become a fruitcake believer and aficionado. Honest, you will. The non-vegan version was my godmother’s recipe. 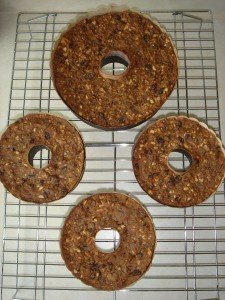 Aunt Dot would bake her fruitcakes weeks before the holidays because once out of the oven, the time begins to macerate them every several days with brandy until they become this incredible delicacy of luxurious fruits and nuts with only just enough cake around them to hold them together. I knew it was the onset of the holidays when Aunt Dot, with my cousin, Daria, alongside her, would be chopping up all the ingredients that were destined to take center stage. Now, admittedly, this cake takes some prep time, figure about two hours if you have a food processor, longer if you are going to chop your fruits and nuts the old-fashioned way, with a knife. Then there is the bake time, slow and low, three hours in total. But again, you (and your gifted recipients) will be joyfully rewarded for all your attentiveness to the details and your patience. I found several websites that sell all natural and/or organic candied fruits. This certainly is a much better alternative over using the supermarket candied fruits that are loaded with artificial color and preservatives. One of my favorite websites for purchasing candied fruits is www.Markethallfoods.com. You certainly could get really ambitious by making your own candied fruits. It’s not really all that difficult, but you must be extremely careful when handling the hot sugared fruits—a liquid sugar burn is probably one of the worst and most painful burns you can get. Candied fruit, if stored in glass Mason jars, sealed well, and refrigerated, will last a long time; so I usually stock up when I order. I’ve even used the leftover candied fruits to make shortbread cookies. I just cut back slightly on the sugar and press the fruit onto the top of the shortbread prior to baking. Yum! If you really want to get decadent, you can then dip these fruited shortbread cookies into some luscious dark chocolate. Need I say more? Mix all ingredients (except the brandy) together. Bake 3 hours (1 hour @ 250 degrees, then 2 hours 2 @ 225 degrees). 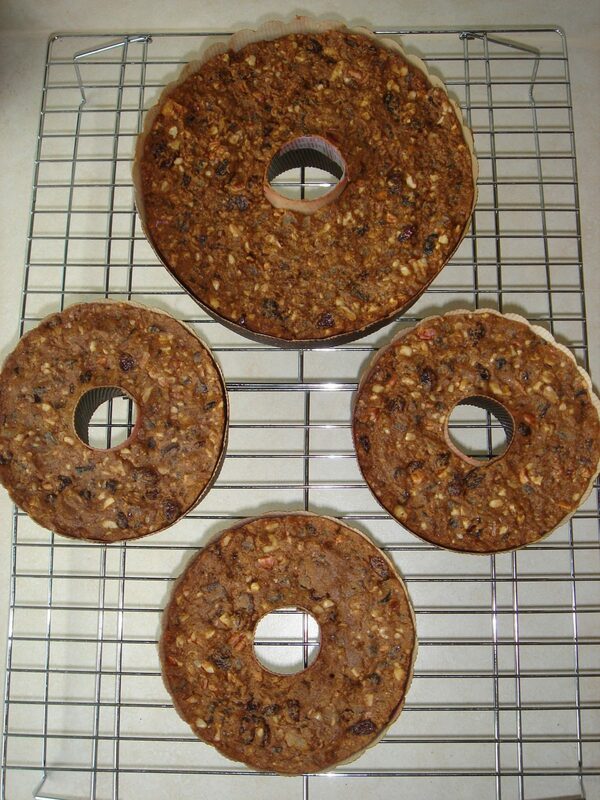 Makes 7 small or 4 large fruitcakes. Cream the ingredients in Bowl #1 until light and fluffy. Add the ingredients from Bowl #2 into Bowl #1, and blend until well incorporated. Add the flour/spice mixture from Bowl #3 into Bowl #1 and mix well. 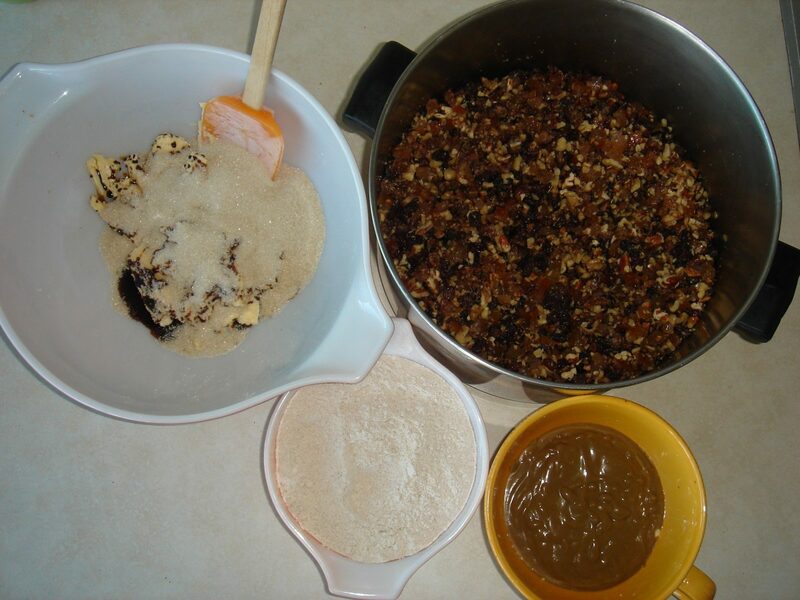 Pour the batter into the fruit/nut mixture in Bowl #4. 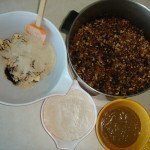 Using a large wooden spoon (or clean hands), mix until evenly incorporated. You will have a very tight batter. Scoop the batter into your prepared pans. Bake 1 hour at 250 degrees. (if you are baking smaller fruitcakes rather than the 2 larger fruitcakes, I suggest reducing the temperature to 215 degrees instead of 225 degrees). If baked in metal pans, allow to cool 15 minutes, then release them from the pans and allow to cool on wire racks. If baked in the paper pans, put them on wire racks. Allow the cakes to cool completely. Once cooled completely, drizzle a couple tablespoons of brandy over each cake. 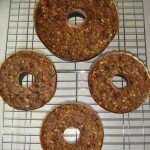 Seal fruitcake and store at room temperature. They should not be soaked. In fact, the brandy should quickly go down into the fruitcake and disappear. Do not drench. Every 2-3 days, repeat Step #10. Do this for several weeks, and you will be pleasantly rewarded for all your effort. *1 Buttermilk: made by adding 1 tablespoon vinegar (I use an artisan black cherry infused balsamic vinegar, but any good balsamic vinegar would do) to ¼ cup canned whole coconut milk, stir, and let sit for a minimum of 10 minutes. *2 These spices are far superior when freshly ground. It can easily be done using an electric coffee grinder, preferably one with a burr mill, that you use expressly for grinding spices. *3 Dates and figs are very sticky, and as such, can be rather tricky to chop. An easy way to get around this fact is to very lightly dust these fruits with a scant (and I do mean scant) amount of flour. Put them in the freezer for no more than 10 minutes. The coolness will greatly reduce their stickiness. A food processor will aid this process as well. Lightly dust the blade. In small batches, put the fruit in the food processor, and pulse until very coarsely chopped. There may still be a couple of larger pieces. Don’t try to break them down further with the food processor. If you do, you will wind up chopping the other pieces too small; so take them out and just finish off their chopping with a knife. To separate the chopped fruit, again dust them every so scantily with a touch a flour and toss to coat, which will release them from each other.